For a business or a brand, social media presence is of the utmost importance. However being on social media is only one part of the story, actually engaging your audience is a completely different task, and a big one in itself! Apart from the number of fans on a Facebook page, their engagement statistics also provide a pretty good yardstick especially when it comes to gauging the amount of fans that they have been able to successfully engage and , and of course, their overall social media success. The more engaged fans on a page, the merrier! 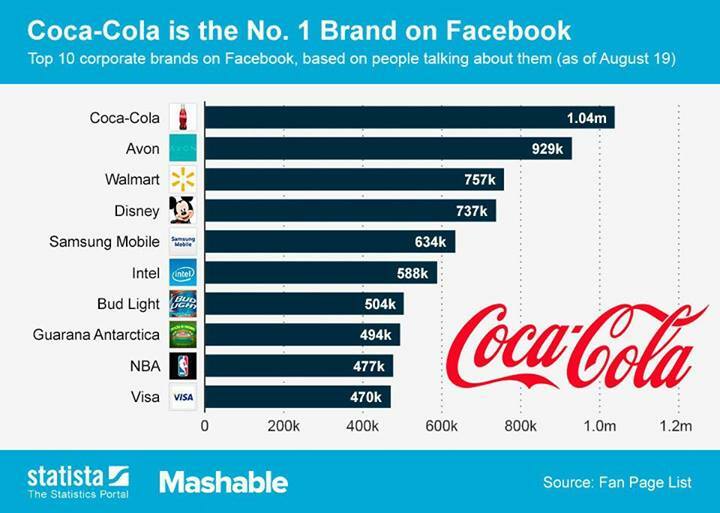 Coca Cola is the king of the hill as far as social media engagement goes, engaging as many as a million people on their Facebook page! They have a very coherent marketing strategy, which means that their Facebook marketing strategy ties in perfectly with their electronic and print media marketing campaigns. The page has over 70 million ‘likes’ to begin with. Coca Cola posts regular updates on their page (the key to engaging your audience!) – including videos and images – and their posts receive thousands of comments and shares, which means that the page is very active. Beauty products company Avon ranks second on the list, engaging almost a 100,000 people on it’s page – far lower than Mashable’s statistics, but still a very big number. The page has 3.5 million fans, and the company makes it a point to keep things updates, and post something every couple of days at the very least, if not more often. Updates include product updates, promotional and marketing updates, as well as endorsements (such as updates regarding the efforts Avon is making for breast cancer awareness) and updates ‘aimed at empowering women’. Walmart is one of the biggest corporations in the world and sits on top of the Fortune 500/50 lists as well. Understasndably, they have a huge following and a firm presence on Facebook as well. There are 32 million fans on their Facebook fan-page, making it one of the biggest communities on this social networking medium. They do seem to be putting up a lot of product-related updates, all aimed at promoting the hundreds of products and services being sold in Walmart outlets, but the updates also include so much more than that. The page engages as many as 700,000 people! 45 million Disney fans, and almost 850,000 of them engaged through their Facebook page – those are some big numbers! I like Disney’s page. Their Facebook page is aimed at engaging people from all kinds of age-groups – kids, as well as adults – and they’ve made it a point to post several updates to the page on a daily basis, which is an excellent strategy to keep fans involved and engaged. Updates include product updates, news about Disney World theme parks from all around the world, announcements, as well as screenshots from some classic Disney cartoons and movies. It’s hardly a surprise that many of their posts have received hundreds of thousands of shares and likes! Samsung was always one of the biggest electronics manufacturer and retailers out there, but their popularity and sales have sky-rocketed in the past 10 years or so, thanks in no small part to their mobile and cellular division. Indeed, Samsung Mobile has been doing extremely well, and the numbers speak for themselves. Samsung cellphones, including the infamous Android OS-powered Galaxy series – sell like hotcakes, which has allowed Samsung to position itself as the market leader in the cellphone industry, leaving the likes of Apple behind, while completely destroying the once-giants such as Nokia and Blackberry. Samsung Mobile’s Facebook pages has 23 million likes but this number is growing quickly. Through a combination of product news and updates, posting their innovative adverts and TV commercials, as well as other interesting updates, they have been able to engage more than 600,000 people on their page. This came as a bit of a surprise – chip and microprocessor manufacturer Intel ranking 6th on the Facebook most engaged brands list! Intel has an excellent marketing strategy, especially judging from their TV commercials and promotions. Their Facebook page provides further proof of this. In order to engage their audience, Intel posts clever puzzles and riddles on their page, posting questions (such as this) and eliciting their fans’ and followers’ response, and of course posting product updates as well. I thought some of their updates – like this one – were quite interesting as well as humorous at the same time. The first thing that’ll probably catch your eye when you visit Bud Light’s Facebook page, is the awesome (and awesomely-cool) cover photo! They seem to know how to use that valuable real-estate known as the cover photo. It is essential to use that space wisely, as it is one of the first things that your fans see when they land on your page, and Bud Light has done it right by posting a cool-blue product image. Job well done! What surprises me is that despite their page having a relatively-small number of fans (‘only’ 6.4 million), they seem to be engaging a rather large number of them (more than 400,000 at the time of writing). Apart from some cool product updates – most some awesome pictures of Bud Light cans and bottles and people drinking Bud Light – the company also engages it’s fans through various avenues, such as this, where Bud Light asked fans to submit pictures of Bud Light cakes and posted them on their Facebook. Guarana Antarctica is a Brazilian-based soft-drinks manufacturer (yes, I had to Google that), and mostly markets their products in Latin America as well as the Latin-speaking world. Their Facebook page reflects this, as all updates are in Spanish. Surprisingly though, they do have a large fan-base on their Facebook page (14 million fans) as well as almost 500,000 people engaged! I could not understand most of the updates posted on the page because of the language, however from what I observed, they do seem to be doing a couple of things right. They post regularly. They are endorsed by Brazilian soccer-superstar Neymar, who also seems to be their spokes-person and the center of all their advertisement campaigns. And finally, they do a good job of consistently using the color green – their brand color – throughout their Facebook updates. 17 million basketball fans, and as many as 500,000 engaged. Not bad for a sports Facebook page! Especially when you consider the fact that the likes of MLB and NASCAR didn’t make the list and don’t even come close! NBA engages half-a-million fans through images of some of the biggest superstars in the game, as well as some of the brightest young up-and-coming talent in basketball. They also post scores, game updates, previews and reviews, information about fixtures, merchandise updates, as well as one-on-one player battles which seem to interest a lot of fans (for obvious reasons) and hence garner a large response. Another surprise inclusion. The Visa page has 8.6 million fans, and engages as many as 700,000 of them! From what I’ve observed, their Facebook page isn’t the most active page you’ll see out there – churning out an update maybe every 3-4 days. They don’t post a lot of product updates either. Which begs the question how exactly have they been able to engage such a large number of people? One glance at their page will give you the answer. They post some of the most beautiful images and photography you’ll see on the internet, but their secret to success is that they engage their fans by asking a question with each of their updates. In some of them, they’ve also tried to link their update (as well as the image used) with their product. A very good strategy when it comes to social media – engaging your audience by asking questions and encouraging feedback. Seems to be working well for Visa. I have to admit, the absence of Red Bull’s Facebook page was a big surprise for me, especially seeing the likes of Visa and Intel overtake it. Red Bull, as you may or may not know, spends a lot of money on marketing, and also focuses on social media marketing but haven’t been able to break into the top-10 as far as engaged fans are concerned. None the less, there are many lessons small and medium businesses looking to build a strong presence on social media – particularly Facebook – can learn from this. Were there any surprise exclusions for you? What lessons were you able to take out from this? Would love you hear your thoughts in the comments section below.